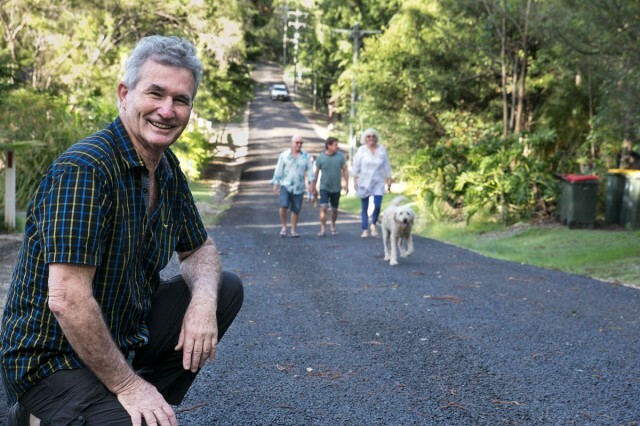 After four years of residents working in partnership with Byron Shire Council, the Skinners Shoot Road upgrade and sealing was completed last week. It ends years of constant complaints and grievances from residents about the poor condition of the rutted road and the increasing concerns associated with the fine white billowing dust which some residents claim was causing health problems. Representatives for the group, Terry and Christine Ahern, said that what started out in 2007 as a petition to Council for a road upgrade has now ended in a council-community partnership and an excellent outcome. They say residents raised $100,000 for the road contributions to upgrade the last 750 metres of Skinners Shoot Road south of Yagers Lane. In addition, he thanked Council staffer Phil Holloway and John Bashforth from Bashforth’s road constructions in processing the works to completion. ‘Initially, Council staff’s standard recommendation was that the cost be attributed by length of road frontage, estimated to be around $200,000. After Tony Pangallo and Christine Ahern spoke at Council’s open access on three occasions to request a different approach, a Council resolution was made to obtain road engineering specifications. ‘The resolution also questioned the requirement for kerb and guttering, and engaged a private contractor to quote and allow residents to make their own arrangements as far as contributions were concerned, especially when four of the landowners chose not to contribute. In 2010, he says, extensive lobbying by Christine Ahern on behalf of the Skinners Shoot Residents Group led to a formal parliamentary petition which was presented to parliament by Don Page MP (Nationals). ‘It had the outcome of an “all weather access” upgrade of Skinners Shoot Road (from Arts Factory to Yaegers Lane) being placed as a condition of consent in the Lismore to Mullumbimby electricity upgrade 3A approval. ‘The electricity supplier Country Energy undertook these works costing around $1,000,000. This has now made Skinners Shoot road infrastructure excellent and improved the amenity for the community immensely. ‘It is a fine example of a small cohesive community lobbying and Council responding, to achieve what was not possible to attain under standard Council practices and policy. ‘A partnership formed between the community and Council and has forged an outcome to improve road infrastructure in a rural area. BYRON Shire Mayor Simon Richardson doesn’t see the newly announced Byron CBD bypass as any kind of silver bullet to fix traffic congestion in and around Byron Bay. But he does see it as a welcome first step in finding a solution to Byron’s congestion woes that will include park-and-ride options and the use of the existing rail corridor. “Byron Bay has a particular set of circumstances, with effectively one road into town and the bulk of the traffic coming from the north,” he said. Cr Richardson also fears that if Byron Bay develops more roads, then that capacity will quickly be filled with more cars. “In Australia, as in America, we are very wedded to our cars and I fear that if we build more roads, we will get more cars,” he said. “The way to deal with traffic is to keep the traffic out and in the past the council have engaged park-and-ride plans for events such as New Year’s Eve. He does see benefits arising from the new Butler St bypass. “People from the Arts and Industry Estate and those living to the south in places like Suffolk Park will be able to move across town more easily,” he said. Cr Richardson also does not buy into the theory that the $10.2m for the bypass has appeared as a way of facilitating the West Byron Development. Driving through Byron Bay at any time of year can be a long and frustrating experience. But traffic congestion is expected to ease by 2016, with $10.5-million allocated to a city centre bypass by the state government. WAIT IS OVER: Byron Bay inner-town bypass road will be built with $10.5 million in state funding. Pictured at the funding announcement are Acting Premier and Minister for the North Coast Andrew Stoner, Minister for Roads and Freight Duncan Gay, Ballina MP Don Page and Byron Shire Mayor Simon Richardson. AFTER decades of talk, a long-awaited Byron Bay bypass can finally go ahead with $10.5 million in state funding announced yesterday. Deputy Premier and Minister for the North Coast Andrew Stoner, Roads and Freight Minister Duncan Gay and Ballina MP Don Page made the announcement outside Mitre 10, Jonson St, where traffic on the inner-town bypass will emerge after entering on Shirley St via Butler St. The Government has put up $500,000 to complete planning for the bypass and $10 million for construction. “This bypass will reduce travel times, improve pedestrian safety and reduce traffic volumes in the town centre, particularly during the busy summer holiday season,” Mr Stoner said. The funding is a coup for Byron Shire Council which would not be able to afford it. “For a small town we are the most visited destination behind Melbourne and Sydney – but we always needed the state to step up and help us,” Mayor Simon Richardson said. “This is a wonderful outcome and although it won’t cure the problem, this allows traffic to get around the town, instead of through it. The community can start popping some champagne corks today. The bypass is another big ticket promise delivered by Member for Ballina Don Page ahead of his retirement, following funding for the new Byron Shire Hospital. “When it became obvious that council could not afford to alleviate the local traffic problems, I supported the council’s request for State Government financial assistance, given the traffic congestion that both tourists and locals have to endure,” Mr Page said. Mr Gay said Roads and Maritime Services would work closely with the council to finalise plans for its preferred route. The state government has announced $10.5 million in funding for a long-awaited-bypass of Byron Bay’s CBD so detailed design work can start immediately. 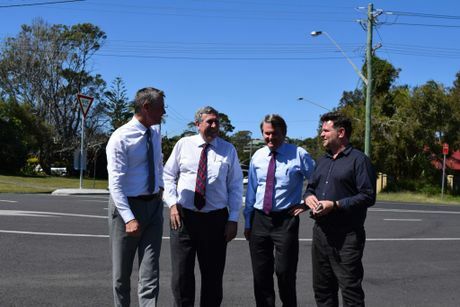 But the surprise announcement made in Byron Bay today (Thursday) by acting premier Andrew Stoner, roads minister Duncan Gay and Ballina MP Don Page has already met with a mixed reception. Byron shire mayor Simon Richardson thanked the government for the ‘once in a generation’ funding and for ‘stepping up and supporting our town’. In contrast, a residents group has labelled the funding a ‘waste of millions for a road less travelled’ and ‘a down payment on allowing the overdevelopment of our town’. The bypass will run from the Shirley Street roundabout along Butler Street and connect to the southern end of Jonson Street via a new rail crossing and intersection at Browning Street near the Mitre 10 store. Years of increasing traffic congestion along Ewingsdale Road into Byron Bay made the lack of a bypass a major issue for townsfolk and civic leaders sick of the traffic jams almost every day, not just during holidays and at peak hours. No time frame has been set but but Mr Gay told media his department and council aimed to finalise plans for council’s preferred route before the end of the year. 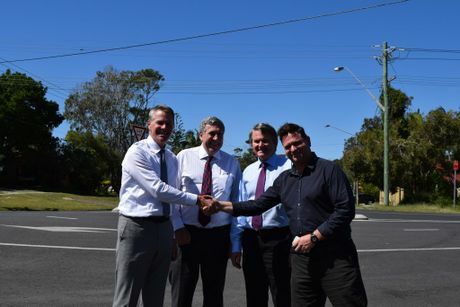 Cr Richardson acknowledged the bypass won’t solve all of Byron Bay’s traffic problems with only one main road in and out at its northern end, but said it was ‘a crucial component to help relieve some of the traffic pain our locals endure on a regular basis’. He said the bypass would ‘also help those who work in industrial estate and Suffolk Park plus the police and emergency services move more freely across town’. Byron Residents’ Group spokesperson Cate Coorey said the bypass was ‘all about getting the West Byron and other large developments through by supposedly “solving” the major obstacle to development on Ewingsdale Road — the traffic nightmare’. Of the $10.5 million in the new funding, $500,000 will go into design work including ecological and flood assessments, noise, stormwater, landscaping, pedestrian and cycling access, lighting, rail crossing and intersection plans. A week ago, Byron Shire Council appointed a consultant to do an environmental impact study (EIS) and detailed design for the bypass. Ms Coorey said that ‘earlier this year when council announced, without any community consultation, that it would run a bypass along Butler Street we were very alarmed, not least because everyone knows that the bypass will not alleviate traffic problems and because such an important decision required a great deal more thought and input’. ‘This bypass is the true “road less travelled” as it is not going to be used by most people coming into Byron. Only 10 per cent of the traffic using Ewingsdale Road is through traffic that is likely to use the bypass,’ she said. ‘All the studies that have been done have shown that this bypass is merely a band-aid on a gaping wound. Everybody knows this bypass will have almost no impact, not least because as soon as the hospital and new developments at Sunrise and Ewingsdale are built, any advantage gained by a bypass would be lost. ‘If the mega-development at West Byron was to go ahead, we’d have a bigger traffic nightmare. ‘Don Page has always said that he would not support the development of the mega-suburb at West Byron unless the bypass was sorted out. ‘Now he has got the cash from roads minister Duncan Gay for a useless bypass, he and council probably believe they can gleefully hand over control of this town to billionaire property developers as it is clear the community has had no say in this,’ Ms Coorey said. Cr Richardson said that Byron Bay, as a small town with 10,000 people and one of the most visited places in Australia behind Sydney and Melbourne ‘clearly cannot work alone or undertake an infrastructure project of this size without financial support from the state’. Ms Coorey said that three years ago, council management had dismissed the bypass proposal. She pointed Echonetdaily to a council press release in which council’s engineering chief Phil Holloway said a study had shown ‘Byron Bay town is the destination for most vehicles and therefore improved access to, and traffic distribution within the town centre, is required. Not a bypass of it’. In the release, Mr Holloway said ‘a true bypass would serve a minority of travellers and is hard to justify in terms of cost-to-benefit and attracting the necessary approvals and funding’. Byron shire mayor Simon Richardson has rejected calls to use the rail corridor in Byron Bay as a road bypass of the town, saying it was an unlikely option. Cr Richardson says the disused corridor should be protected for the future use of rail, and changing its status would increase the temptation for governments to privatise it. Community calls for the much needed bypass to ease congestion on the northerly entrance to the town have increased since plans for the proposed West Byron subdivision were announced. But Cr Richardson said Transport for NSW (TfNSW), the owner of the rail asset, and its agent John Holland Rail, which has the contract for property management, have confirmed that an Act of Parliament was needed to remove the status of the rail corridor. ‘Apparently the rail corridor is protected by legislation for the exclusive use of rail, regardless if the corridor is used or not,’ he said. ‘The Act would need to be changed to first remove the protected status, which in turn may allow other uses for the land to be considered, and then subject to development and agency approvals etc. ‘This however could see the rail corridor open up to many potential uses, not just transport purposes, and would presumably also attract market rates whether for lease or sale. ‘As it is located in Byron Bay, it would likely be considered high value real estate,’ he said. Cr Richardson said he had been advised that as the rail corridor width varies greatly in Byron Bay (and across the shire), it was ‘unlikely a single, continuous lineal, multi-modal transport corridor is possible that could accommodate rail, a bike/pedestrian shared path and a road. ‘Put simply, in most locations the width of the rail corridor would not allow multiple uses to co-exist. ‘However, Council is very keen to ensure all stones have been turned to investigate the best bypass route option. We will meet with the Grab the Rail Group to further investigate their ideas,’ he said. The mayor also noted that Council and the community were waiting on the findings of the state government rail trail report. He said the consultant engaged for the report had raised the issue of co-existence with Council and other interested stakeholders. ‘The current Byron Bay bypass alignment, west of the rail corridor, does not rule out the potential return of rail services, whereas a declared change of use within the rail corridor would,’ Cr Richardson said. The State Government will fund a technical study of plans for a major bypass of Byron Bay’s town centre. The Minister for Roads met with the Byron Shire Council’s general manager and mayor yesterday to discuss the town’s urgent need to ease traffic congestion. Ballina MP Don Page says around 10 million dollars is necessary to create a bypass to Browning Street, at the southern end of the CBD. He says the State Government is willing to help get the job started. “The council has advised us that they need about $220,000 to do a detailed geo-technical study of the extension of the Butler Street section of the bypass,” Mr Page said. “We are doing what we can to assist council and we have indicated to them that we will pay for the geo-tech studies to be done and they are grateful for that. “It means that the project can start to progress in a realistic sense. “My main concern is to see what the state can do to assist council to put in place a Byron bypass because the situation is pretty serious in terms of traffic. “Even though it is a local responsibility I’m keen as the local state member to see what we can do… working with council and potentially working with the West Byron land owners to see what they can do up front. The Byron Mayor says a bypass would only go part of the way to solving the town’s traffic problems. Simon Richardson says the council could definitely not afford to cover the entire cost. “And I would argue that the community wouldn’t even want to if we could,” he said. “The bypass is certainly no silver bullet for our traffic. “All the studies have suggested that at best it will provide an avenue for 18 per cent of the traffic. Meanwhile, a parking trial proposed by the Byron Shire Council has been scaled back. The original plan was for a two-hour parking limit to be imposed between the Belongil and Red Devils fields for a period of 12 days. The town’s tourism lobby group yesterday voiced concerns about the length the trial and size of the area affected. The council has now decided to only impose the restrictions between Boxing Day and New Year’s Day. A park-and-ride trial will continue until the 6th of January.